Festivals in a number of ancient civilizations were celebrated with lights; any and all of these may have been the inspiration for the lights we use to decorate Christmas trees and the exteriors of homes. The Druids in both France and England believed that oak trees were sacred, and they ornamented them with candles and fruit in honor of their gods of light and harvest. The ancient Roman festival of Saturnalia included trees decorated with candles and small gifts. The worship of trees as the homes of spirits and gods may have led to the Christmas tree tradition and that tradition has long been accompanied by the companion custom of decking the tree with brilliant lights evoking stars, jewels, sparkling ice, and holiday cheer. From the beginnings of Christianity to about 1500, trees were sometimes decorated outdoors, but they were not brought into homes. One legend has it that Martin Luther (1483-1546), the father of Protestantism, was walking through an evergreen forest on Christmas Eve. The beauty of the stars sparkling through the trees touched him, and he took a small tree home and put candles on its branches to recreate the effect for his family. The Christmas tree became a custom in Germany, and German-born Prince Albert took this tradition with him to England when he married Queen Victoria during the mid-nineteenth century. The first Christmas tree in Windsor Castle was decorated with candles, gingerbread, candies, and fruit. Similarly, German settlers brought the Christmas tree to America where the first tree was displayed in Pennsylvania in 1851. Candles were attached to the boughs of the trees with increasingly extravagant candle-holders, some with colored glass that made the lights appear colored. Of course, the practice of using candles was hazardous; many fire brigades were called to extinguish fires started by candles that had ignited the trees or the long hair or dresses of the ladies. Candles on trees were lit for several minutes only and sometimes only on Christmas Eve or Christmas Day; the custom of lighting trees for extended periods of time had to wait until the invention of the electric light bulb. Candles were expensive in the mid-1800s, and tallow lights or nutshells with oil and floating wicks were also used. Various forms of brackets and hoops to hold candles, drip dishes hung under the candles, and twisted candles to channel melted wax were attempts to limit the fire hazard and the mess from dripping wax. In 1867, Charles Kirchhof of Newark, New Jersey, invented the counter-weighted candle holder that had a weight for balance suspended under the branch beneath the candle. The balance held the candle upright, and it was also brightly painted or decorated to add another spot of color to the tree. In 1879, the spring-clip candleholder was created by Frederick Arzt of New York. This clip was much lighter in weight than the counterbalance, and it was used until the 1920s when electric lights finally extinguished the use of candles on Christmas trees. The first electric lights for Christmas debuted only three years after Thomas Alva Edison invented the lightbulb in 1879. Edward Johnson, a resident of New York and a colleague of Edison's, was the first to have an electrically lighted Christmas tree in his home in 1882. The tiny bulbs were hand blown and the lights were hand-wired to make this event possible, but it opened an avenue for Edison's electric company that produced miniature, decorative bulbs for chandeliers and other uses from its earliest days. Electric lights appeared on the White House Christmas tree in 1895 when Grover Cleveland was President. General Electric (GE) bought the rights to light-bulb production from Edison in 1890, but GE initially only made porcelain light bulbs. To light a tree, the family had to hire a "wireman" who cut lengths of rubber-coated wire, stripped the ends of the wires, fastened them to sockets with brass screws, fitted a larger socket to a power outlet or light fixture, and completed assembly of a string of lights. This was too expensive and impractical for the average family. In 1903, the Ever-Ready Company of New York recognized an opportunity and began manufacturing festoons of 28 lights. By 1907, Ever-Ready was making standard sets of eight series-wired lights; by connecting the sets or outfits, longer strings of lights could be made. Ever-Ready did not have a patent on its series-wired strings of lights, and this basic wiring system was adapted by many other small companies. These sets were not always safe, and episodes of tree fires raised public alarm. In 1921, Underwriters' Laboratories (UL) established the first safety requirements for Christmas lights. A number of light manufacturers merged in 1927 to form the National Outfit Manufacturers Association (NOMA), which went on to dominate the Christmas light business, with GE and Westinghouse as the leading bulb makers. Also in 1927, GE introduced parallel wiring that permitted light bulbs to keep glowing when one on the string burned out. Bulb shapes also evolved. In 1909, the Kremenetzky Electric Company of Vienna, Austria, began making miniature bulbs in the shapes of animals, birds, flowers, and fruit. Companies in the United States, Japan, and Germany also made figurative bulbs, but Kremenetzky consistently made the most beautiful glass that was hand-painted. World War I ended the influx of Austrian lights. GE made machine-blown shapes beginning in 1919, and the Japanese light-bulb industry, then in its infancy, began filling the void left by the Austrians. The Japanese techniques continued to improve and were quite sophisticated by 1930, but this trade ended with World War II. NOMA started to make tiny lampshades with Disney figures on them to fit over standard miniature bulbs in 1936. The most spectacular miniature bulb success was the bubble light. Carl Otis invented it in the late 1930s, but World War II also interrupted this development. Bubble lights were finally introduced in 1945, peaked in popularity in the mid-1950s, and declined by the mid 1960s. So-called midget lights, midget twinkle lights, or miniature Italian lights began arriving from Europe in the 1970s and became the best sellers of all time in the Christmas tree light business. Holiday lights are made of three sets of materials. The strings are composed of 22-gauge copper wire that is coated in green or white polyvinyl chloride (PVC) plastic. Specialized manufacturers supply the wire on spools that hold 10,000 ft (3,048 m) of wire. Two plugs begin and end each set of lights, and they are made of injection-molded plastic. The lights are held in lamp holders that are also injection-molded plastic and contain copper metal contacts. The second set of materials goes into the making of light bulbs. The bulbs are made of blown glass, metal filaments, metal contact wires, and plastic bases. Bulbs are made in clear glass to produce white light, or they are painted to shine in assorted colors. Finally, the finished sets of lights require packing materials. These include a molded plastic tray, a folded cardboard display box, and shipping cartons that hold multiple sets of boxed lights. The shipping cartons are made of corrugated cardboard. Each set is also packed with adhesive-backed safety labels and paper instruction and information sheets. All of the paper goods are made by outside suppliers and are produced from recyclable materials. The basic design for holiday lights consists of a tried-and-true string of green plastic-covered wires with clear or colored light bulbs. Design aspects include the number of lights on the string (in multiples of 25 with 25, 50, 100, or 125 bulbs) and whether the string contains only clear bulbs, bulbs of a single color, or assorted colors of lights. Green wires were made originally to blend in with the green branches of evergreens, either as indoor Christmas trees or outdoor shrubs. The tiny lights are used for many other holidays and for garden displays, so strings with white wires are made for other decorating uses. Plastic covers for the lights are also designed with Christmas and childhood themes as well as an extraordinary range for party decorating from aquarium fish to chili peppers. The newest designs to take the decorating market by storm are nets of lights that can be spread over shrubs to save time in decorating, and icicle lights that look like long white icicles hanging from house eaves. Fiber-optic lights also became available in the 1990s; they are basic strings of wire and light bulbs, but each bulb is the source of light that passes through clusters of fiber-optic wire held in plastic covers that clip onto the bulb. Usually, they resemble flowers or other designs that take advantage of the cluster-like display of optic wires. 1 A supplier of copper wire delivers large spools of wire to the holiday light manufacturer. The light maker may coat the wire in PVC plastic or purchase it already coated. The plastic resin used to form the wire coating contains additives that make the plastic resistant to ultraviolet (UV) rays in sunlight and to hot or cold temperatures; the strings can, therefore, be used in most climates year-round and can be left in the sun without breakdown of the plastic. 2 Each light set is made in series-parallel construction with twin wires. One wire is cut to the full length of the light string. At one end, the molded load fitting or wall plug is molded to the wire; the end connector is molded to the other end of the string. The end connector is made so another light set plug can be added to it, and multiple strings can be attached to each other. Each plug has a three-amp fuse in it; if too many sets are strung together, the fuse will blow before the sets overheat and cause a fire. 3 The second length of wire is assembled in 6 in (15.24 cm) long segments with the lamp holders as the links between each pair of segments. For example, a 100-light string will have 99 of the 6 in (15.24 cm) long parts. Manufacturers call the entire assembly of wire segments and lamp holders a membrane. The membrane is made by hand assembly. A worker takes one 6 in (15.24 cm) segment and places an end in a machine that strips the wire by trimming away the plastic from the wire end. A copper metal contact or flange is contact-welded to the wire end by the same machine. 4 The tiny lamp holders have been made of injection-molded plastic, again by the manufacturer or by a specialty supplier. The end of the wire with the metal flange is fitted into the lamp holder. It is pushed into place, and the flange snaps into the lamp holder. Another 6 in (15.24 cm) wire is hand-fitted into the other side of the lamp holder; this time, the stripped end of the wire without the copper flange is pushed snugly into the lamp holder. The flanged end of that wire goes into another lamp holder and so on. 5 When the 6 in (15.24 cm) segments have all been linked to lamp holders, the segmented wire is paired with a continuous wire. The two segments at the ends of one string are fitted into the load fitting (wall plug) and the end connector like the ends of the continuous wire. The double string is then taken to a twisting machine that twists the two wires together so they will be easy to string on a tree or other application without gapping apart. Light bulbs will be added to the string in the final assembly before packaging. The light bulbs used in the manufacture of holiday lights are made at a circular table. The table rotates, and, as it turns, each glass module is processed into a completed bulb. First, the module is heated, then it is blown into the bulb shape. As it continues on its circular path, the filaments and elements are added to the inside of the bulb. The hot glass is pinched down to be sealed, but, just before it is sealed, a vacuum is applied to the bulb to remove the oxygen. This step is precisely done so the vacuum inside the bulb will be correct for the lighting filament to function. processed to contain exact amounts of glass for the bulbs are vibrated into slots on a round table. The table rotates, and, as it turns, each glass module is processed into a completed bulb. Different operations are stationed around the table much like hour markers on a clock. First, the module is heated, then it is blown into the bulb shape. 7 As it continues on its circular path, the filaments and elements are added to the inside of the bulb. The filament is a metal subassembly that has been prefabricated and that will glow and produce light when electricity is applied to the bulb. One of the elements in the filament is a shunt at the base of the filament; if the filament breaks, the shunt drops into place and completes the electrical connection that previously was made by the working filament. The completed electrical connection keeps the string of lights operating when that single filament breaks and its bulb doesn't light. 8 The hot glass is pinched down to be sealed, but, just before it is sealed, a vacuum is applied to the bulb to remove the oxygen. This step is precisely done so the vacuum inside the bulb will be correct for the lighting filament to function. The end is sealed, and two wires are pressed into the hot glass. The finished, clear bulb is forced out of its slot on the table after it has completed the full rotation of the table, and another module of glass drops into that slot to begin the process again. 9 The clear glass bulbs are complete, but colored bulbs have to be painted. Magnets pick up bulbs to be painted by sticking to the wires protruding from the bases of the bulbs. The magnetic line feeds the bulbs through a paint tunnel; all the bulbs on one line are painted the same color. They are left to dry then deposited in a bin for further processing. 10 On the assembly line, the plastic bases are added to the bulbs. The bases have been formed by injection molding to fit the lamp holders for the particular manufacturer's range of lights. Assembly line workers feed the two wires sticking out of the bottom of the bulb into the plastic base and fold the two wires by hand against the sides of the bases where they will make contact with the metal flange in the lamp holder. The bins of completed bulbs in the bases are transferred to the factory where the assembled wire strings await. 11 The bulbs are inserted into the lamp holders by hand. The finished strings are folded into the correct pattern to fit the plastic insert trays, and they are fitted into the trays. The trays are conveyed to the final testing line, and every set is plugged in to confirm that it lights. 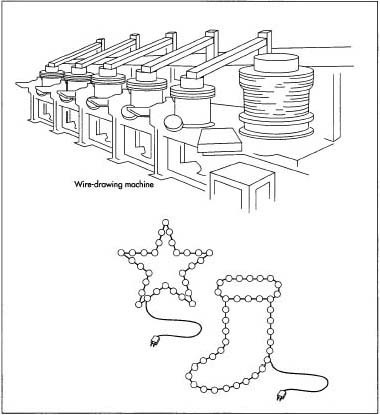 Copper wire is used in the manufacture of holiday lights. Spools of wire are coated with PVC plastic that is resistant to sunlight and to hot or cold temperatures. The series-parallel construction is made with twin wires. One wire is cut to the full length of the light string. At one end, the wall plug is molded to the wire; the end connector is molded to the other end of the string. The second length of wire is assembled with the lamp holders as the links between each pair of segments. The wires are connected with a copper metal contact or flange that is contact-welded (heated and melded) to the wire. 12 The tested sets in their trays are conveyed to the packaging department. Caution labels are wrapped around the plug end of each string, the tray is put in the cardboard display box, an instruction sheet with manufacturing and safety information is added to the box, and the box is sealed. The individual boxes are packed in shipping cartons with many other sets for overseas shipment to distribution centers. Top-quality UV additives, plastic resin, copper wire, and glass are chosen to make lights that will last for many years of use. Manufacture of the wire string is monitored continuously by the assembly line workers. The bulb-making process is inspected when the bulbs are forced out of the circular table where they were formed and fitted with filaments. Painted bulbs are inspected again after the painting process. The completed string is tested after all the bulbs have been inserted in their holders and the string has been packed in the insert tray. The test consists of actually lighting the string. Underwriters' Laboratories (UL) also establishes standards for the manufacture of holiday lights and tests them for quality and safety. Manufacturers of holiday lights make all kinds of sets including sets of clear and colored bulbs, sets with a variety of numbers of bulbs, fish-net style strings, icicle lights, sets with bulb covers in an amazing array of styles, and other holiday lighting products. Waste consists of broken glass bulbs, plastic stripping from the wires, broken plastic packing trays, broken plastic lamp holders and trimmings from them, and bits of copper wire. All amounts are small, and all materials can be recycled. Manufacturers of holiday-related products know that trends in these products typically last three to five years. Tinsel and glass ornaments were out of style until the mid-1990s when they experienced a renaissance. Stringed lights have also gone through their own rebirth and are very popular for use in gardens and houses as year-round accessories, not just holiday decorations. Ongoing research and development is attempting to produce brighter lights. High-tech titanium and tungsten filaments are in the development stage, as of 1999, to make miniature lights that are twice as bright as anything previously produced. Like many other products, trends and popular demand will phase out existing products in popularity and introduce new ones to brighten parties, decor, and holidays far into the future. Rogers, Barbara Radcliffe. The Whole Christmas Catalogue. Los Angeles: Price Stem Sloan, 1988. Snyder, Phillip V. The Christmas Tree Book. New York: Penguin Books, 1977. Brite Star Company, Inc. http://www.britestar.com/ .